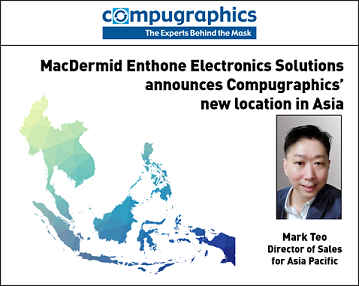 Compugraphics, a leading photomask manufacturer based in the US, UK, and Germany, and a business operated as a division of MacDermid Enthone Electronics Solutions, is pleased to announce the opening of a new sales office in Singapore and the appointment of a new Director of Sales. Mark Teo has joined Compugraphics as the Director of Sales Asia Pacific and comes to them with 10+ years of experience in the photomask industry and extensive semi-conductor knowledge. Compugraphics‘ migration arises from the desire to mesh an expanded array of opportunities in the Asia Pacific region with a greater global presence for client support. Walt Laskow, Vice President and General Manager, said “By having a physical presence in Singapore, we are confident of adding tremendous value, competently coordinating client-focused projects, and providing better support for the cycle of design-through-production, to all of our customers located in Asia Pacific.